One of the leading computer brands, HP has stepped into the entry level tablet market in India with its 7 inch android based tablet without sim support, HP 7 Plus Tab. The device looks handy for its price and is all set to land into the entry level tablet segment. 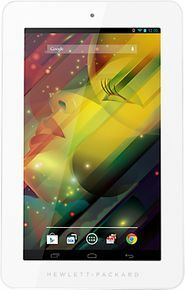 HP 7 Plus Tab best price is 5299, available on snapdeal.com. HP 7 Plus Tab houses a sleek design detail with 8.1 mm thickness, which gives it an edge over the rivals and gross weight of 294 grams. The tablet has a slimmer and lighter design than HP Slate 7 Voice tab. The top edge of the tablet has got a 3.2 mm audio jack, a micro sd card slot and an adjacently located micro usb 2.0 port while the screen lock button and the volume keys are housed on the right edge. It incorporates a 1 ghz quad-core Cortex A7 processor with 1 gb ram, which make it not really a great option as compared to its rivals. The 7 inch tablet has an inbuilt memory of 8 gb which can be expanded upto 32 gb by a micro sd card. The powerhouse of the device is a non-removable 2800 mah Li-Po battery. HP 7 Plus Tab runs on Android OS, v4.2.2 (Jelly Bean). This version of android in non-upgradable and there are devices in the same price segment which come with an upgraded android kitkat 4.4. The tablet includes Bluetooth, wifi and some exclusive apps like hp connected music, hp file manager, etc. HP 7 Plus Tab sports a 2 mp primary camera and misses the flash by its side, which makes it a not very commendable option for photography. Daylight pictures are crisp and bail out on finer details, while pictures taken in low light are not worth the price. The VGA front camera is just a choice over nothing as its existence doesn’t really count. The 7 inch display of the tablet is an IPS LCD display with a resolution of 1024x600 and a capacitive touchscreen. The display is not bad for the price and provides sufficient visibility in daylight. HP 7 Plus Tab online price in India is around 5500, is a device for tab lovers with low budget. An elegant device with effective multitasking. The primary camera is not as good, but what more can you expect for this price from a brand like HP! Good to go for beginners, sufficiently efficient and a worth its cost device. It is a very poor quality tablet..
1. Battery is very bad. 2. Cemera is very poor quality. 3. Heating problem every time. 4. This tablet is very Weight. I bought this tablet on 22 December 2014 and after 3 months it get into a big problem.Whenever it get switched off or if the whole battery got drained and power get off,it restored to factory mode and all data,apps and other things get deleted. I complained at service center ,then given me replacement of new HP 7 plus tablet but after few months,it also get infected with same problem.Again I got replacement from service center with new one and as others only after 2.5 months it also get involved into same problem. Hmm what's this . Is HP is outdated or Their services and product?